The Barn01263 715779work01603 870304fax Self-cateringBinham is famous not only for its blue cheese, but also for its beautiful 12th century priory which dominates the center of the village and plays host to summer concerts. It is a delightful and traditional village, which has great access to the salt marshes and beaches of the north coast. 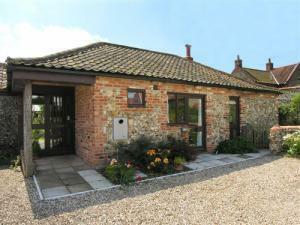 The Barn is an annexe to the owners' property, and offers four star single storey accommodation with a garden. Binham is famous not only for its blue cheese, but also for its beautiful 12th century priory which dominates the center of the village and plays host to summer concerts. It is a delightful and traditional village, which has great access to the salt marshes and beaches of the north coast. The Barn is an annexe to the owners' property, and offers four star single storey accommodation with a garden. From Fakenham, keep on A148 and after about 5-6 minutes, pass Texaco garage on right and take next turning left at Crawfish Thai Restaurant (signposted Thursford Green/Hindringham). Train to Norwich or King's Lynn and from there by taxi.